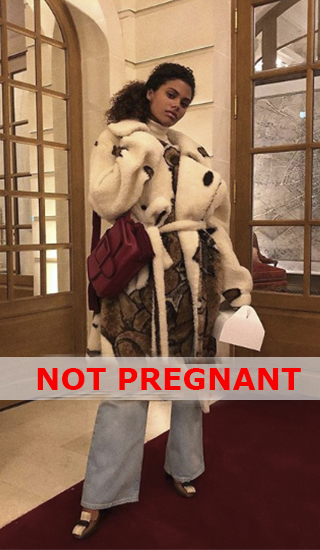 Recently, Vincent Cassel's girlfriend (51) Tina Kunakey (21) is wearing voluminous cloaks and fur coats, and the other day she posted on Instagram Stories a video in which she is seen sitting in the top and she has a baby bump! There are no rumors that Kunakey is pregnant in the media yet. The first joint photo of Tina Kunakey and Vincent Cassel appeared in the media in August 2015, the second - while the actor was resting with the model in Ibiza. We were confident - it won't last long. But the pair has once again proved that love knows no age! Tina said about how they met: "just happened to be in the same time in the same place," and in spite of rumors, they met much earlier than the summer of 2015. Vincent Cassel married a young sweetheart - model Tina Kunakey just a month ago. The bride recently turned 21 years old. A modest ceremony attended by only the closest ones took place on Friday, at the mayor's office of Bidar near Biarritz (south-west of France).